Within a short period of time, from October 1917 to February 1918, the Bolsheviks consolidated their control over the greater part of the territory of the former Russian Empire. One of the chief reasons for this, to use Lenin’s phrase, the “triumphal march of the Soviet power” across the country, was, undoubtedly, the mass support of the first Soviet decrees. Their general democratic character met centuries-old expectations of the majority of the Russian population. In the conditions of an economic dislocation and unpopular war a radical program of rapid and sweeping reforms appealed to many social groups. The Decree on Land sanctioned the transfer of the gentry’s land to the peasants, ensuring the loyalty of rural communities. The Decree on Peace gave hope of a speedy end to the war with Germany to the demoralized and exhausted army. The “Declaration of the Rights of the Peoples of Russia” promised equality, sovereignty, and the right to free self-determination to all nationality groups and facilitated the acceptance of Soviet power on the multiethnic fringes of the empire. 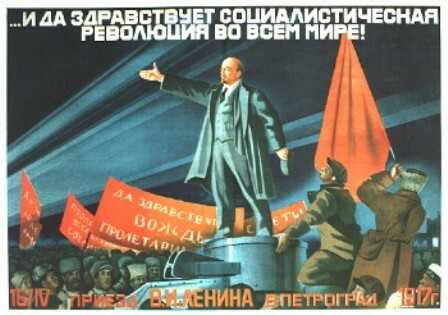 The political system that the Bolsheviks were forging in the months following the October takeover was distinctly different from the original idealistic blueprints of a “proletarian dictatorship.” Before taking control of Russia, Lenin had spoken of doing away with the punitive machinery of state and replacing it by “direct arming of all the people.” The population would be armed to defend the country from any external threat, while the resistance of the former propertied classes inside would be overcome with the help of the organs of popular democracy, such as soviets and people’s militia. However, the brutal logic of holding on to power compelled the Bolsheviks to establish their own secret police, the All-Russian Extraordinary Commission for the Struggle against Counterrevolution, Sabotage, and Speculation (better known by its Russian acronym Cheka). Set up in December 1917 under the leadership of Felix Dzerzhinsky, Cheka was granted wide powers from arrest and investigation to passing and executing sentences. Its arsenal of repressive measures also included property confiscation, withdrawal of food coupons, blacklisting individuals as “enemies of the people,” and expelling people from the country into external exile. Cheka evolved into a formidable instrument of the “proletarian dictatorship,” suppressing resistance not only of the Bolsheviks’ natural enemies, such as the propertied classes, but also of their former allies, including moderate socialists and anarchists. Moreover, the new regime soon realized that it would not survive without a modern army to defend the new state. In January 1918 the Bolshevik government announced the formation of the Workers and Peasants’ Red Army to be recruited on a voluntary basis. In a short period of time a network of military commissariats was set up in localities, and, by May 1918, the Red Army was expanded into a formidable 300,000 strong military force. Lenin’s concept of the dictatorship of the proletariat left no place for other political parties in the new state system. It accorded the Russian Communist Party of Bolsheviks (as it became officially called in March 1918) the role of the core of the proletarian dictatorship. The party directed activities of all governmental and nongovernmental organizations. It tolerated other socialist groupings only if they recognized the legitimacy of Soviet power and the supremacy of the Bolsheviks as the ruling party. In practice, this led inevitably to the emergence and rapid consolidation of a one-party system.